You know what I feel like right now? No, don't you roll your eyes at me. It's not another drink, although that would be nice too. No, I'd like to stroll, hand in hand with the Boy to my local cinema and settle down to a nice Sunday evening flick. Arty or blockbuster, I don't much care. Perhaps Confederate States of America, that might be interesting. Or maybe Cars, the new Pixar toon that the Boy wants see as he's an animator. What's the problem I hear you say? You can hop in the car and nip to Vue at Cribbs Causeway, a mere 20 minute drive away. Or Showcase, in the other direction. Yeah, s'pose. But I don't want to. I don't want to drive anywhere. I want to walk to my local cinema and then afterwards, perhaps have a cup of coffee somewhere local. I don't want to go to a big featureless out of town box that's going to show me 30 minutes of ads and be playing the latest Sandra Bullock on all 10 screens. I want the Whiteladies Picture House. Built in 1921, it's a gorgeous Art Deco building, at least from the outside. (I have never been inside) It entertained Bristolians for about 70 years before being closed down, not long before I moved to Bristol. It was owned by the Odeon chain. No problem right? They'll restore it and open it up as a nice local art house catering to students and the local Cliftonians and Cothamists. Hah! It was sold to a developer with a restrictive covenant imposed by Odeon preventing it being used a cinema. So now, what I presume was the lobby is a restaurant/bar called The Picture House, about which I have heard good things (but that's a matter for Bristol Foodie) And the rest is boarded up and disused. 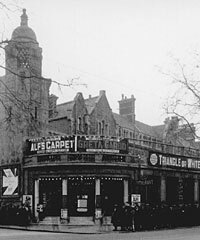 I believe there were plans to turn it into a gym which seem to have come to nothing, largely I believe due to a vociferous local campaign to bring back the Picture House, although I may be wrong about this. Time for another drink. And then a perhaps a walk to the video shop. I have been quite boring lately and do not have much to blog about. Siiigh. I mean, look at me, blogging on a Saturday night? How middle aged. The Boy is, as I write this, watching an extremely gory and poorly acted horror movie called The Devil's Rejects. I am not a horror fan, so I'm pretending I can't hear the screams. The only new things to turn up recently are our absolutely hilarious disco wardrobes. There has been a permanent clothes storage crisis in the BG household ever since we moved into our current digs. I've flatly refused to solve it by purchasing wardrobes from IKEA because, y'know wardrobes? From IKEA? Not all that cheap. Especially when you consider they are made of cardboard. And I'm too cheap to spend £200 on a cardboard wardrobe that'll only last a few years. Another solution would be to buy old fashioned pieces from the 40s or 50s or older from antique/junk shops. However, I consider these not really suitable for modern clothes storage, although tres chic and far more appealing than IKEA. I have discovered in the past that they tend to be oddly arranged and often too shallow to take the width of a clothes hanger, which you might think you can live with, but usually ends up being incredibly annoying. Plus your clothes get all smooshed. So, yes the disco wardrobes? Are vintage IKEA. Some neigbours are moving out and offered them to us for free. They are black, with fully mirrored doors and little metal handles. V.80's disco. That puts paid to my theory about IKEA furniture not lasting. The funny thing is, I do quite like them now, for all they are so tacky. I might tart them up with some different handles and I've always wanted a wardrobe with a lipstick red interior, but ultimately I'm just relieved all my clothes don't have a thick dandruff of dust on the shoulders.